Quad Cities Community Foundation / Generosity lives here. We aspire to be your most trusted resource for community generosity. The Quad Cities Community Foundation is the place where generous people in the Quad Cities (and beyond!) make gifts to support their community, organizations and causes most important to them. We are a public charity committed to listening to our donors’ charitable goals and working alongside them to help them best meet their hopes and dreams. Thanks to the generosity of donors to our Community Impact Fund and other funds, the Quad Cities Community Foundation has awarded nearly $73 million in grants to nonprofit organizations in our region. Find out what you can apply for today—or in the near future. The Community Foundation stewards nearly 1,000 funds, including close to 200 funds established by our region’s nonprofits. You can also establish a fund of your own to accomplish the goals you have for your generosity. We’ve condensed our types of funds for you, but the best way to find the giving option best suited to you is to talk to us. Through the Community Impact Fund, the Quad Cities Community Foundation is able to support nonprofits and initiatives that have the ability to transform our region. Find out more about the Community Impact Fund, and make a gift today. Celebrate the transformation happening every single day. During and after the recession, most charities were forced to operate with less money. Now, ten years later, Michelle O'Neill of WVIK-Quad Cities NPR reports contributions have been rising, but nonprofits and foundations in the Quad Cities face other challenges. Listen to our President and CEO Sherry Ristau talk about the state of philanthropy. Earlier this month in our e-newsletter, we were pleased to share a story of generosity. I hope you were able to look through the diverse, lengthy list of nonprofits that Quad Citizen and Quad Cities Community Foundation Donor Maggie Tinsman has contributed to. Maggie is clearly demonstrating the benefit of giving through the Community Foundation. More importantly, you can see that she is significantly improving the lives of others. We proudly support communities beyond the Quad Cities. The Quad Cities Community Foundation empowers generosity in communities from Geneseo to Fulton, North Lee County to Cedar County, Florida to Arizona, and beyond, through Geographic Affiliate Funds started by communities, for their communities. Community Funds, like our Quad Cities Disaster Recovery Fund, provide support to communities when they need it most. We love the Quad Cities region—a place that we are proud to call home. Every single day, we strive to bring creativity, flexibility and passion to our work, and stand ready to partner with you so that you can give back to the communities that you love. Get to know the Quad Cities Community Foundation. 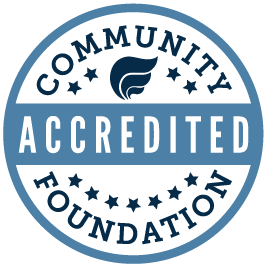 The Quad Cities Community Foundation was among the first to receive accreditation from National Standards for Community Foundations as set forth by the Council on Foundations. The accreditation represents operational effectiveness to foster excellence in community philanthropy. As of September 30, 2018, we’ve granted nearly $73 million back into the community. This year along, we’ve made $100,000 investments in organizations like the Child Abuse Council to support at-risk mothers and their newborn babies, $15,000 Challenge Grants to nonprofits like Transitions Mental Health Services, and Capacity Building Grants to support technology upgrades to organizations like Prairie State Legal Services.